Kathmandu, Nepal -- A Bengal tiger fitted with a GPS tracking collar and translocated from Nepal's Chitwan National Park to Bardia National Park has been killed, according to Department of National Parks and Wildlife Conservation officials. Authorities believe the tiger died after eating the flesh of a cow deliberately laced with poison. 3 men suspected of involvement in the death have been arrested. “Namo Buddha’s unfortunate end underscores the fact that efforts to protect Nepal’s tigers are a serious challenge and such efforts now need to be further strengthened and consolidated,” said Anil Manandhar, Country Representative of WWF-Nepal. The charred remains of the tiger’s GPS tracking device was found near where it had last been geolocated. The animal’s body has not been recovered. The tiger, discovered injured near Chitwan last year, was rehabilitated in captivity before being released into Bardia in January by WWF and Nepalese officials as part of a range expansion program. “While this incident has been a turnaround to our conservation plans, it is in no way a deterrent to keep investing in people, science and technology to help protect wild tigers,” Manandhar said. 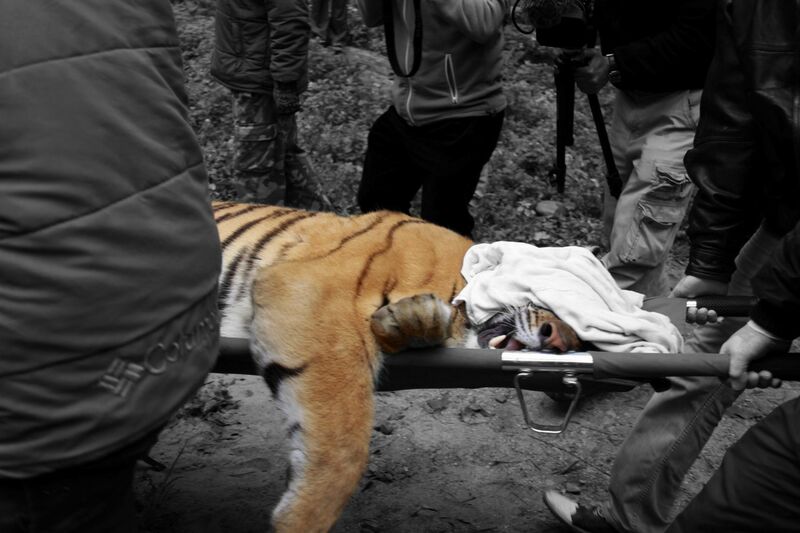 A Bengal tiger, named Namo Buddha by conservationists, being fitted with a tracking collar and translocated within Nepal.